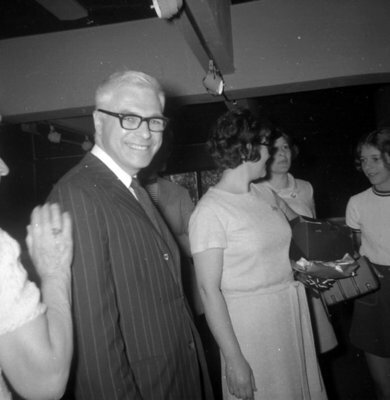 A black and white photograph of Marcel Robidas (November 4, 1923- May 17, 2009), the Mayor of Longueuil Quebec in 1970. The twinning of Whitby, Ontario and Longueuil, Quebec is considered one of the longest and most successful in Canada. The Mayor of Whitby, Desmond Newman, and the Mayor of Longueuil, Marcel Robidas, signed the Twinning Protocol in June 1969. Longueuil, Quebec is located on the south shore of the St. Lawrence River. Twinning of communities promotes cultural and commercial ties between the communities. Citizens from Whitby visited Longueuil in June of 1970. Whitby Twinning Visit to Longueuil, Quebec, June 1970, Brian Winter. Whitby Archives A2013_004_315.